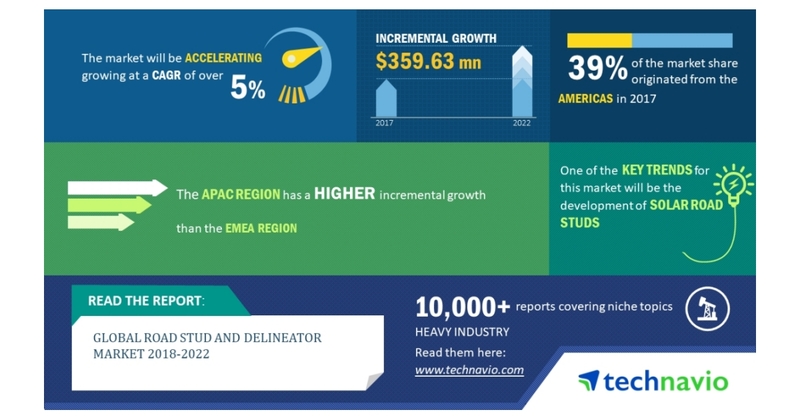 LONDON–(BUSINESS WIRE)–The global road stud and delineator market is expected to post a CAGR of over 5% during the period 2018-2022, according to the latest market research report by Technavio. A key factor driving the growth of the market is the increasing incidence of road accidents. A major number of road accidents occur because of human errors such as over speeding, drunk driving, and non-compliance and adherence to traffic rules. Additionally, poor infrastructure facilities and lack of implementation of proper road safety equipment and devices are other main causes of road accidents. This market research report on the global road stud and delineator market 2018-2022 also provides an analysis of the most important trends expected to impact the market outlook during the forecast period. Technavio classifies an emerging trend as a major factor that has the potential to significantly impact the market and contribute to its growth or decline. The demand for solar-powered road studs, which ensure passenger safety on city roads, highways, construction sites, railway platforms, and airports is increasing continuously. Solar road studs are solar-powered LED studs, which are mainly used during construction activities to demarcate road edges and center lines. “One of the important features of solar studs is that it emits a minimum scattering light, making it visible even at 900 meters under clear weather conditions. Solar studs offer 10 times the visual range over conventional road studs. Thus, vendors are concentrating on continuous R&D activities on LED-based traffic safety equipment,” says a senior analyst at Technavio for research on construction. This market research report segments the global road stud and delineator market by product (road stud and road delineator) and geography (APAC, EMEA, and the Americas). The road stud segment held the largest market share in 2017, accounting for nearly 69% of the market. This product segment is expected to dominate the global market throughout the forecast period. The Americas led the market in 2017 with close to 39% of the market share, followed by APAC and EMEA respectively. APAC is expected to witness the fastest growth during the forecast period.